Imagine having mastered sleep, and all you have to do is just sleep while you reap its benefits beyond just health. You may already know the benefits of sleep. Just to name a few, sleep can increase your productivity level, gives you energy, helps you lose weight and gives your skin a nice glow. Here are 5 things you need to know about mastering sleep so that it works for you, and not against you. 1. The 2 hours before midnight is GOLD. Ever heard of any models or celebrities say sleep is their beauty secret? Sleep is your body’s natural way to detox and renew your body everyday. It helps maintain your health, and essentially aging. I know that you do not want to look older than your age. But here’s the tricky part, in order for sleep to become your own beauty secret, you’ve got to sleep by 10PM (or 11PM the latest). The 2 hours before midnight is when your body’s natural detox and renewal process is at its highest peak. So make good use of what you already have. 2. Switch off everything – yes, your phone included! Ever wonder why we have day and night? Sun and moon? Light and dark? The world has been built perfectly to our advantage, just like your beating heart! The reason why it’s dark during the night time when you sleep is because light interferes with your sleep. In short, your body produces a hormone called melatonin when you sleep. Melatonin is used to help you enter deep, restorative sleep so you wake up feeling refreshed. When there is light, it interferes with your melatonin production, hence causing you to toss and turn during your sleep. Even if the light is very small – like the backlit of your laptop or the few seconds when your phone lights up, it interferes with it. There are a lot of debates going on until this day about caffeine. Some say it’s bad for you, some say it’s good. As always, listen to what your body is saying. If caffeine makes your body feel good, don’t stop drinking your coffee just because they say it’s bad. But if you are drinking your daily cup of coffee, drink your last cup of coffee for the day latest by 3PM. The caffeine in the coffee can interrupt your sleep, hence keeping you awake when it’s bedtime. Worst of all, you won’t be able to sleep for 7-8 hours if you’re waking up early the next day. Want to have uninterrupted sleep? Don’t drink water or any liquids before bedtime. Drink them at least 2 hours before bedtime. This will ensure that you do not wake up at night for toilet trips. However, if you are feeling thirsty before bedtime, this could be a sign your body is telling you that your body is dehydrated. This could mean that you did not drink at least 2 litres of water that day. If you did, this could mean that your body isn’t absorbing the water you drink. If that’s the case, try hydrating your body with fruits with high-water content. 5. Go to bed with positive thoughts. This is the key to mastering your sleep so that it works for you, not against you. Even if you do not implement the 4 things above, this is one thing you wouldn’t want to miss out. Why? That’s because you spend about 1/3 of your life just sleeping! And you don’t want to spend that 1/3 of your life thinking negative thoughts, would you? When you sleep, your subconscious mind takes over. This means that your conscious mind is in an unconscious state. Think about this for a second. Do you know what you think when you sleep? I’m guessing its a big no. The thoughts you think in the last 5 minutes before you sleep can affect how you feel when you wake up the next morning. This last 5 minutes basically acts as a programming for your brain on what to think when you sleep. If you think negative thoughts such as never ending to-do list, the bad things that happened in your day today, or dwelling on your “should-have”, your subconscious mind is programmed to think that way when you are asleep. So when you wake up the next morning, well, you don’t feel great. So, one way you can spend these last 5 minutes is by practicing gratitude. Here is a great post that teaches you how you can practice gratitude. You can check it out here. Now, I want to hear from you. 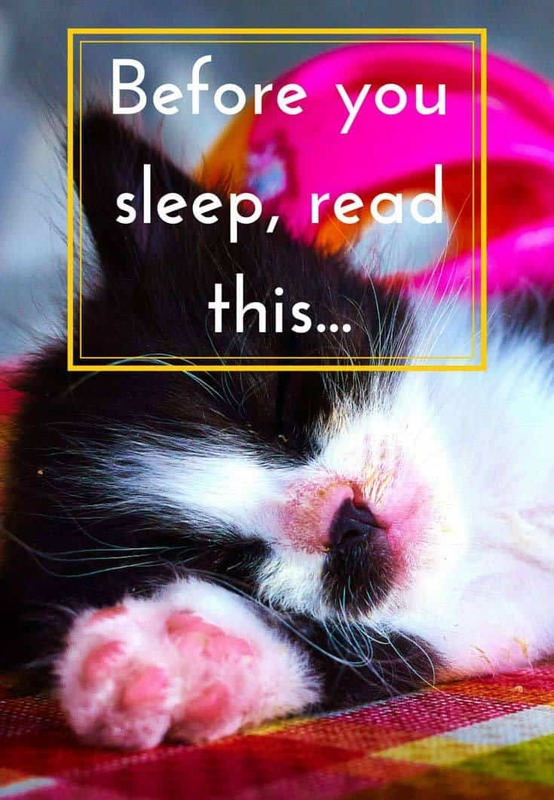 Share with me in the comments area below is your sleep working for you or against you. Which step you will be implementing into your life? I read all of them and I love hearing from you! Picture by Moyan Brenn from Flickr. Alexia helps women feel irresistibly beautiful; and through that help them look amazing, feel amazing, and be amazing in their life. She is a Holistic Beauty Coach and a certified Health Coach. Think of Alexia as your loving, supportive best friend, personal cheerleader, beauty coach and authenticity sidekick. You can connect with her at her website or on social media (Facebook, Instagram).